The fundamental issue with SSL is that of trust. Despite all the effort that has gone into a robust and cryptographically secure design for SSL, its foundation is still easily abused. In this paper I will explain an often-overlooked area of SSL exploitation. That is the ability for any certificate to act as a root Certificate Authority for a system that can easily be added surreptitiously. I’ve wanted to write about this very simple, yet often overlooked SSL attack technique for a while but hadn’t found the time. After working through a few scenarios I’ve come to the conclusion that this is a relatively stealthy and very effective post exploitation tactic. I consider this to be a post exploitation tactic because you need to already be in a position of power to assign a certificate as a trusted root certificate. The core issue here is that there’s no distinction between Certification Authorities that have been added independently and those that are considered ‘standard’. The main point I wish to make is that a person in a position of power can easily abuse SSL. So even though users might be well trained to make sure they see the ‘lock icon’ in their browser they are still completely susceptible to real world attacks with real consequences. I had also wanted to write about government and nation states’ abilities to easily circumvent the protection provided by SSL, but someone beat me to the punch. There’s actually a very well written paper by Christopher Soghoian and Sid Stamm, which you can download at http://files.cloudprivacy.net/ssl-mitm.pdf. This attack also has implications for systems other than SSL, however SSL is an example we can all understand and is the technology we’ll focus on here. We will look at the implications of each of these shortly. If you have domain admin why do you need to do this? Couldn’t you use any of another million more obvious choices like install a keylogger, rootkit, etc? I agree, there are some cases where other traditional methods make more sense if you already have local admin on the target system. However you shouldn’t completely disregard the attack, as there are scenarios where this makes more sense. The biggest advantage appears to be that of stealth and ease of exploitation. You can leave no other trace on a system except for a certificate and have the ability to then capture very sensitive data from the network. Ask yourself; in all your years of scanning for viruses and malware, examining rootkits, performing forensics, etc, have you ever considered looking at all the certificates on a system to ensure they are all meant to be there. With viruses, rootkits and backdoors there’s something to be discovered, including network traffic when the backdoor reports back home. With a rogue certificate there is a quiet, seemingly innocent entry in the client’s registry. You could also consider a pure social engineering attack. Users might be educated enough to not run an executable downloaded from the Internet but would that same employee know to not install a ‘random’ certificate. If an attacker were to spend 3 minutes over the phone directing a user to install a new certificate would the user think anything of it? Now lets look at how someone would go about executing such an attack against an entire network once domain administrator privileges have been obtained. You have a few options here on how to actually create the certificate that will be used as a CA certificate. I’m going to generate the CA certificate on a linux (backtrack) computer because it’s easily scriptable from the command line. The openssl utilities are included with backtrack as well as most major distributions. If you were so inclined you could easily create the same certificate on a Windows server. We’ve also filled in all the values to describe our certificate. 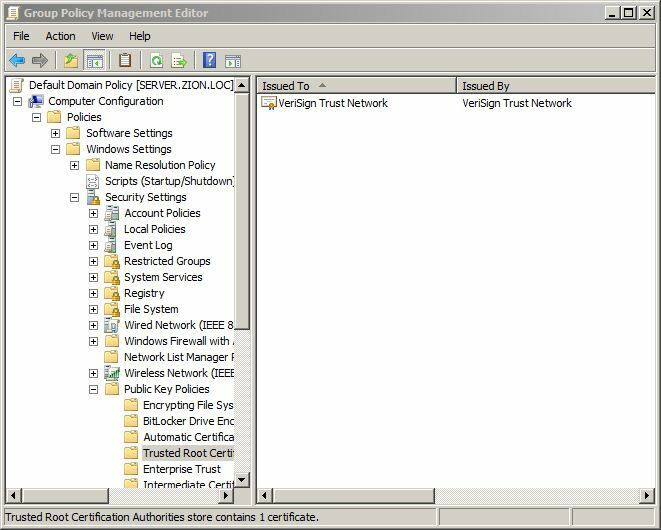 In our example we created our certificate to look very similar to one of the default VeriSign certificates included with Windows 7. This would make it even more difficult for someone to determine the validity of the CA certificate. If we wanted to be super evil we could match the expiration date and the additional OUs with that of the legitimate certificate to make it even more confusing for a would-be forensic examiner. The next step is to get the certificate itself onto our target machines. The most effective way is through Group Policy. With Group Policy we can push a certificate out to an entire domain, which includes servers and client computers. First you need to copy the crt file we generated earlier to the computer which has access to configure a Group Policy Object. Note that you only need to copy the certificate, not the key file to your target machines. There are two scenarios that stand out for deploying a rogue CA certificate via Group Policy. The first is that of an unscrupulous employee doing something they shouldn’t and the second is that of an attacker wishing to further his hold on a compromised network. Both of these scenarios would require a certain degree of stealth. Thus we probably wouldn’t create an entirely new GPO, instead we would bury this configuration within an existing GPO. Right click on the right pane and choose Import. The wizard is pretty self-explanatory. Now our certificate will be propagated to every machine for which this GPO applies. If you would like to install this on a single test machine you can simply double click the crt file and choose Install Certificate as in the following image. 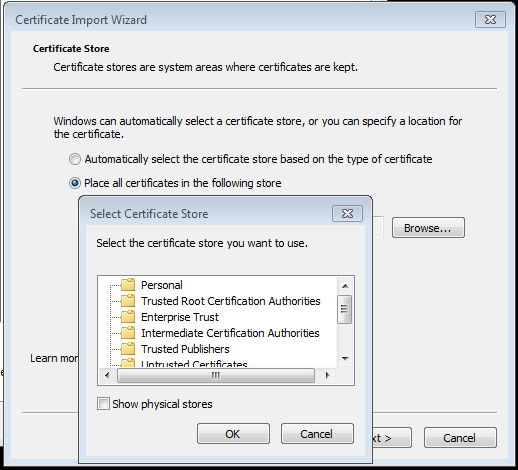 We then want to manually assign this as a Trusted Certification Authority so we choose the ‘Place all certificates in the following store’ option, choose Browse and then select ‘Trusted Root Certification Authorities’ as in the following Image. Voila, we can now create certificates for any website, ANY. We have the option of creating a certificate for a specific website or system and use this in a more directed fashion. We also have the option to dynamically create certificates for any website the user visits, which will be covered next. 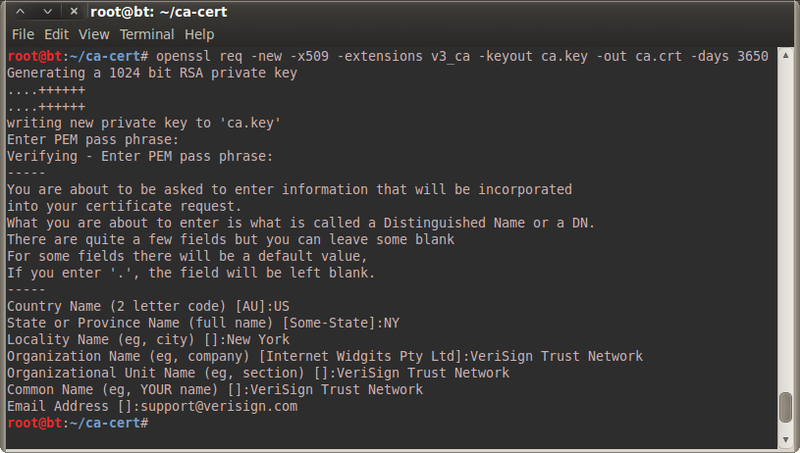 Finally we sign the CSR with the CA key we created earlier and we have the certificate for our server ‘server.crt’. We would then configure our web server to use the certificate. Backtrack comes with a good example SSL configuration for apache at /etc/apache2/sites-available/default-ssl. For apache you’ll need to combine the server key and certificate into one file with the following command. You would then use the .pem file for your apache server. Dynamically creating a certificate is much more fun than just creating a single phony web server. Luckily Moxie Marlinspike already wrote the sslsniff tool which allows us to dynamically create website certificates based on the users request and sign it with a CA certificate of our choosing. The sslnsiff utility comes preinstalled on backtrack. To use the sslsniff program we need to first turn on IP forwarding on our machine and then configure iptables to send any traffic destined to port 443 to the sslsniff program. The sslsniff program will then handle the actual SSL MITM and dynamic certificate creation. To enable ip forwarding we use the following command. We then configure iptables to forward traffic to our sslsniff program, which will be listening on port 9443. We also need to combine our Certificate and Key into one file, just like the previous apache example. We then configure sslnsiff to listen on port 9443 with this command. The –a option tells sslsniff to run in Authority mode in which it will act as a certificate authority and sign all certificates with the cert pointed to by the –c option. We then give an output file with the –w option. Now for the fun part, actually intercepting SSL encrypted traffic. The attacker has many options for initiating the Man-In-The-Middle attack. This is a perfect time for a DNS Poisoning attack however we could also use an Inline Sniffer or any layer 2 MITM (ARP Poisoning, ICMP Redirect, etc). The best option depends on a myriad of factors but we’ll just use a simple ARP poisoning attack here for simplicities sake. Here are all the commands necessary to kick off this attack.